Hackney Winterville back for a Second Year – Taking over a snug corner Victoria Park in Hackney, Winterville is a Christmas celebration with something for everyone. 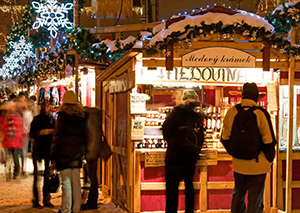 From 26th November the magical festive village will be set up and visitors from around London and beyond will be along to see the great range of events at the village, until it finally packs up on 23rd December. So pick up your Easirent hire car from our London Stansted Airport branch and get involved in the festivities. In its second year there will be plenty to do at Winterville, including the new Winter Night Garden, an enchanted forest which will play host to a number of Christmas film screenings including The Muppets Christmas Carol and Home Alone and there will also be a fun nine-hole putting challenge from Plonk Crazy Golf, with a special festive theme so visitors can putt across snow drifts and fog filled valleys. Winterville also brings the circus to Hackney with performers from African Whirlwind and the Moscow State Circus providing aerial performances and daredevil tricks and at the heart of it all with be the Spiegeltent, home to pantos, cabarets and live music, with many club nights organised too. Kids can enjoy their own heated indoor area with soft play and a café as well as the chance to visit Father Christmas in his grotto and the team at Bizarre Bazaar are bringing back their quirky Victorian-style market from last year, with food, drink and arts and crafts. Winterville is free to explore but events at the circus, Spiegeltent, crazy golf area and ice rink are ticketed and prices vary. The fun Christmas atmosphere is great to explore whether you’re paying for events or not.